Losing your home to foreclosure through a sheriff's sale may not end your financial difficulties with your mortgage lender. 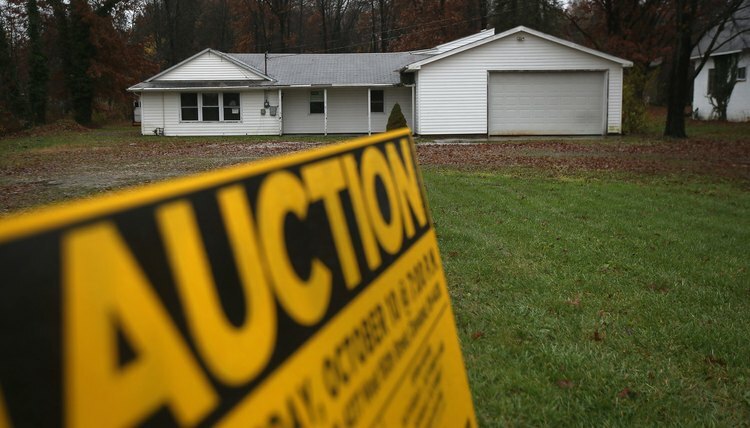 If your home is sold at auction for less than what you still owe on the home loan, the bank may still sue you for the difference plus attorneys' fees and costs. Filing bankruptcy will give you protection from your creditors and wipe clean your debts. Once your bankruptcy petition is filed, an automatic stay is put in place that prohibits creditors from attempting to collect on outstanding bills. Determine which type of bankruptcy best meets your needs. Under a Chapter 7 bankruptcy, any nonexempt assets are sold to pay your creditors and you receive a discharge of eligible debts within three to six months. However, to qualify you must not earn more income than the median income for a household of your size in your state. If you do not qualify for a quick discharge under Chapter 7, you may file under Chapter 13, where you are placed on a three- to five-year repayment plan. At the completion of the Chapter 13 plan, any eligible unpaid debts are removed. Attend a court-approved credit counseling course. Petitioners for both Chapter 7 and Chapter 13 bankruptcy are required to complete an accredited credit counseling course before filing a petition for bankruptcy. Many of these brief courses can be taken online or over the phone. Complete and file form B-1, voluntary petition for bankruptcy, and all required attachments with the clerk of the bankruptcy court. You are also required to pay a filing fee of approximately $300 for Chapter 7 and Chapter 13 cases. The appropriate bankruptcy forms are available at the bankruptcy court for your federal judicial district or online. In addition to listing your contact information and the chapter under the bankruptcy code that you are filing, you must also list an estimate of the number of creditors and amount of outstanding debt owed. File additional forms required by the court for the type of bankruptcy you file. If you file a Chapter 7 bankruptcy, you will be required to file a statement of intention, listing all exempt assets and whether you intend to keep the property by reaffirming the debt owed or whether you are giving up the property for sale. In a Chapter 13 bankruptcy you are required to file a proposed repayment plan identifying your income and necessary expenses and how much you propose devoting each month to repaying your lenders. Attend a meeting with the court-appointed trustee and your creditors. In a Chapter 7 case, the purpose of the meeting is for the trustee and your creditors, including your mortgage lender, to ask you questions about your assets and whether there is additional nonexempt property that could be sold to pay your debts. Once all nonexempt assets are identified and sold, any remaining debts owed to your mortgage lender are discharged along with your other debts. Set the terms of your repayment plan during your meeting with creditors if you have filed a Chapter 13 bankruptcy. During this meeting, you establish how much money you pay to the trustee each month. The trustee apportions these payments to your creditors, including your mortgage lender, for the duration of your repayment plan. At the conclusion of your Chapter 13 repayment period, your remaining mortgage debt will be discharged if it is not paid in full as a result of your bankruptcy payments. The Law Offices of Curtis Walker: How Does Bankruptcy Work With a Foreclosure? Bankruptcy Law Network: What is the Statement of Intention in a Chapter 7? The Law Office of Shawn N. Wright: Can I Stay in My Home After a Sheriff’s Sale?